Polly by Joanna August (BHLDN): Soft ruffles create smooth, fluttering lines in a graceful sheath silhouette. This lovely chiffon wrap dress evokes a sweet message of romantic bliss. Juliette by Jenny Yoo (BHLDN): Gold-flecked lace in a sweetheart neckline kisses a flowing tulle skirt for a heart-fluttering, romantic statement. Convertible straps and soft shades of blush offer multiple styling options. Accent your bridesmaids with lovely organza flower combs, sparkling gold jewelry, or classically beautiful headbands to create a mood of timeless romance. Raquel by Adrianna Papell (BHLDN): Gracefully draped and beaded tulle creates a vision of goddess-like beauty, while nature-inspired designs and delicate gold hues make a stunning statement of elegance. Style your bridesmaids with glittering gold, nature-inspired accessories to create a look of dreamy Grecian beauty. Georgina by Hitherto (BHLDN): Pairing the timeless beauty of chiffon with a delightfully modern design, this chic little dress opens a world of styling opportunities. Accessorize your bridesmaids by mixing and matching different styles. Glamorous jewelry and bold, vintage-inspired rhinestone pieces jazz up this simple look! Sloane by Quilaree (BHLDN): A light little lace number with a romantic blush overlay and sheath design. Whimsical eyelash lace presents a picture of pretty yet laid-back beauty. Outfit your bridesmaids with pretty pearl accessories, soft lace accents, or metallic flowers to create a look of effortless style. Chloe by Jenny Yoo (BHLDN): Featuring a sweetheart neckline with illusion lace and a soft, ethereal tulle skirt, this lovely little dress evokes a dancer’s grace. Twirl like a ballerina- on pointe. Are you gushing over these blush ensembles as much as we are? 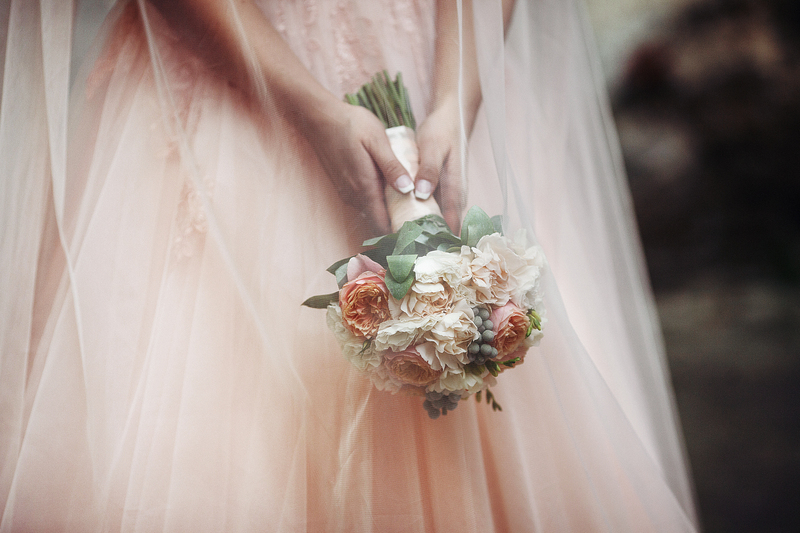 Let us know how you’re styling your bridesmaids for the big day! Still figuring out how to match your bridal gown with the perfect headpiece and veil? Check out our My Bridal Style pages and our We ♥ Blush Pinterest boards for accessory inspiration.